The Akademy 2018 ends today. Like each Akademy I attended, it was an interesting experience. As the location switches around each year, so does the set of people attending change every year, too. Beside the presentation tracks and the e.V. meeting, several of the BoFs did spark my interest. In the KDevelop BoF, Sven talked about what could be done to give the current KDevelop project a bit more focus on the parts it does well to polish them more for a better user experience. 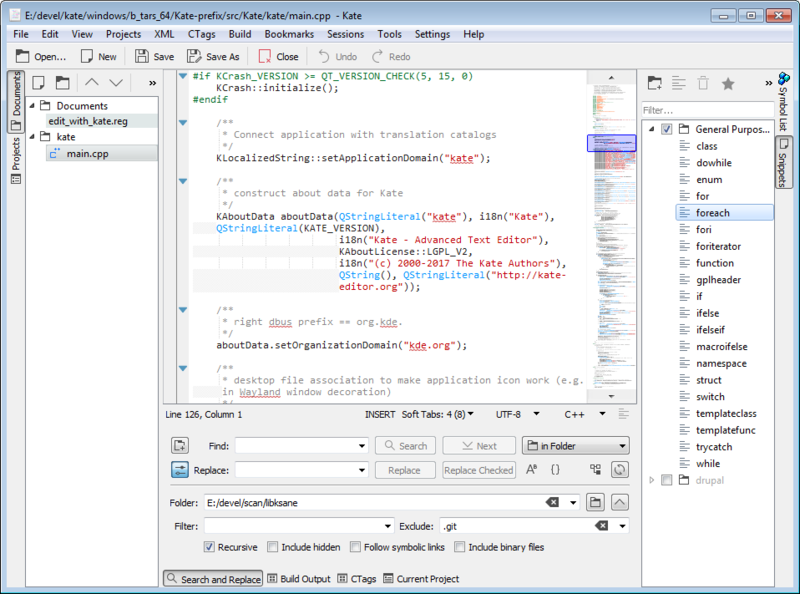 The idea is that if you get KDevelop shining even more in the areas it is good at and perhaps cut off some parts that are really given bad impressions, one might attract more people to both use it and contribute. It is still to be discussed if this idea is shared with the other KDevelop contributors. In the kdesrc-build BoF Michael talked about the current state and collected pain points from the audience and potential future extensions. For example an API to allow to build a light-weight GUI tooling around kdesrc-build to ease the entry to the KDE development was one topic of interest. 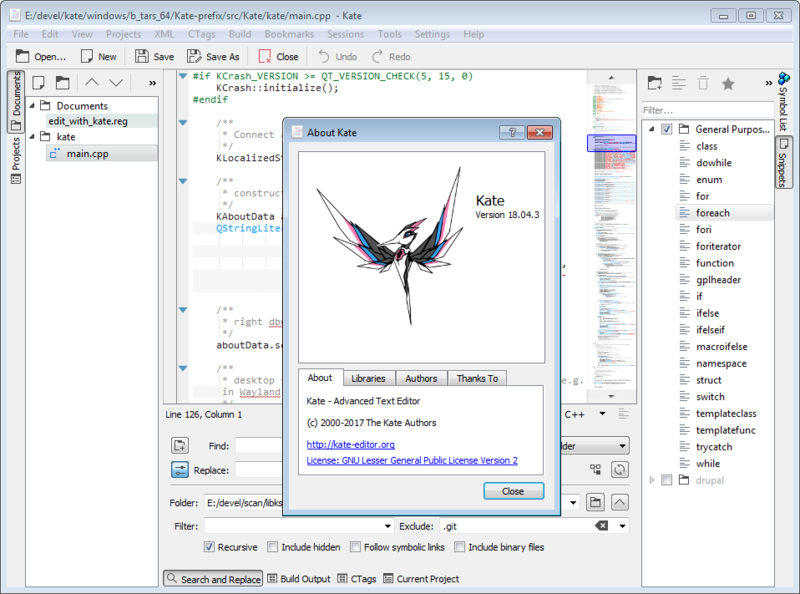 Between the conference/BoF/socializing parts of Akademy, I got plenty of time to finally work again on some KTextEditor/Kate related tasks. With help of Dominik and Volker I got to integrate the KSyntaxHighlighting framework and we even got at least some initial contact with the QtCreator team about the topic of integrating this framework to replace their own implementation of the Kate syntax definition handling. If you experience any issues with the highlighting or folding in the master branch, please file a bug or even better provide some patch on phabricator. In addition some small KTextEditor and Kate bugs got either solved or at least started to be worked on again. Help with any bug fixing is always welcome! As small but perhaps for users important step was to actually link to the new and shiny Windows installers that the Binary Factory for KDE produces. Thanks to the team behind that, once more. Hopefully that will lead to more users and developers for Kate on Windows. Thanks to the organizers to make this Akademy happen and all people that volunteered! Great job! The sponsors are highly appreciated for their contributions, too. During Akademy it was brought to my (and the other Kate developers) attention, that we should take a closer look on the Binary Factory for KDE. There were some blogs about the Binary Factory in the past but we somehow never really linked it on our homepage as potential source for up-to-date installers for the different operating systems. I feel a bit sorry for neglecting that area in the past year. Therefore, as we have now some time during Akademy together as team, we did take a look at the current state of the installers there for Windows and macOS. The Windows installer is working fine. Kåre’s manually created installers are better optimized for size by stripping out things not that commonly used, on the other side the Binary Factory installers bundle more stuff like all translations/dictionaries that might be interesting for some people, too. One other thing that might be fine tuned is the used frameworks. For example the KActivities is not useful for Kate on Windows and we normally disable that for our own build, at the moment the factory still includes that (as it is an optional dependency). If we fine tune that a bit more in the future, I think we can close the gap between the hand-tuned installer and the autogenerated one even more. In other parts like the KHotNewStuff integration the current factory installer even provides a better experience than our last published own one. And last but not least, the binary factory creates an installer every night for the stable and the development version, so we get up-to-date installers with no manual work. The macOS installer is on-par with what I did manually a year ago (but than gave up due to loss of interest). Therefore we now link the nightly build for that on our homepage as primary preview build. The state is still not that good, but that is not a fault of the installer creation. The macOS port just lacks manpower, as myself has no longer that much interest in improving it and it still is in a “usable” but non-polished state that will still crash in a few situations, which makes using it not that nice. Any help there would be appreciated. As a conclusion I must say, I am personally impressed how well the Binary Factory installers work. They are a real big step towards having people use up-to-date versions of our tools on operating systems other than the usual unices. Thanks to the team behind that and all others that contributed, including our sysadmins that keep all the stuff running the whole time! I hope we make good use of that infrastructure in the future. Thanks to Hannah, Kevin, Ben and all others that contribute to this effort! And thanks to Kåre and everybody else taking care of issues on Windows or macOS. The download page is now updated to provide links to both the latest successful Kate release and nightly builds of the Binary Factory. 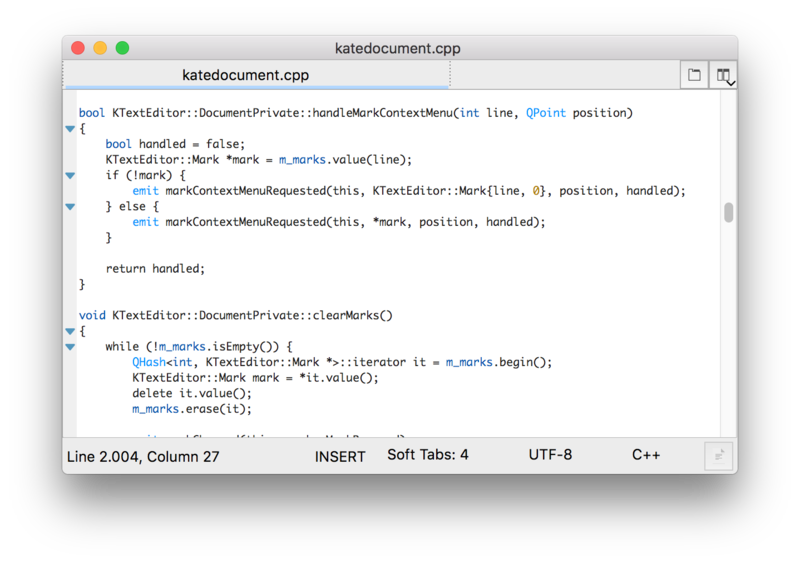 During Akademy there was finally enough time to finalize the porting of KTextEditor to KSyntaxHighlighting. The branch for the integration was merged to master yesterday, unit tests look OK and I am using that state now for my normal coding work. Beside minor glitches that should now be corrected, no issues came up until now. But as with all changes, for sure some regressions slipped in. If you notice strange behavior of the highlighting in master, please report the issues on bugs.kde.org or on our mailing list (or even better: provide a fix on phabricator). For sure there are potential further cleanups and now that we have only one implementation of the highlighting infrastructure, we will be able to move forward with extensions of it much easier. We contacted the QtCreator people, to see if we might be able to share a common implementation, as they have an own one at the moment. Hopefully that works out in a nice way and our KDE syntax-highlighting framework gets an even broader user base!